The largest hip pads I sell, in supersoft flesh like silicone - now with mesh reinforced edges. My Opinion: "Made from a super soft silicone compound these hip pads feel realistic to the touch. They have a thin skin of stronger silicone and now come with mesh reinforced edges to prevent tearing. 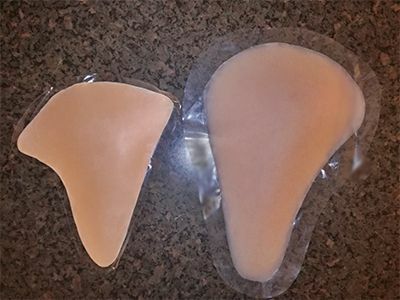 The shape of these pads will give you the most realistic feminine shape you can get. If you are worried your hips will never have the shape to look or feel really feminine - then you need to seriously consider these pads." These extra large hip pads are shaped to perfectly replicate the female shape. They are larger and thicker than the other pads, and are perfect if you really want to show off your hips. Most importantly the thickness extends into the lower portion of the pad - which is where women tend to hold more weight. This will give you a more feminine profile than any other product available, and will fill out your figure and make a noticeable difference even on the larger frame Will add 4-5" around your hips and bum. The Hip Creator XL (right) is significantly larger than the Large Hip Enhancer (left). With double the amount of silicone it gives the most noticeable effect you can get. Most importantly the volume extends further down the leg where women tend to hold their weight. Fantastic hip pads! They feel so well made, firm but not to firm. Surprisingly comfortable to sit on especially on harder surfaces...wooden chairs etc. These pads look and feel sensational to wear, once you find the sweet spot to locate them. But it is vital you purchase appropriate shape wear to hold them in place. The thin edges do blend so well and with shape wear you honestly can hardly see or feel the edges. So happy I made this purchase, I cannot believe how much curve and fullness these pads provide me,they make me feel fab when dressed. Many thanks Geraldine. Thank you so much for the womanly figure I've always wanted. I am thrilled at the difference they have made. I love my broad feminine hips. I am sure that the transformation of my figure will also give extra confidence when I'm out in public. I think the silicon is better that the smaller one I had a few years ago. The size and density is great. Yes it's heavy but the dimension / width of the hip gives you such a great curve This is perfect.